Top wireless Bluetooth speakers you can confidently take outside. What makes a good Bluetooth speaker for outdoors? Tells water-protection level. Higher is better. Battery life on full charge. Support for aptX Bluetooth codec. Input & Output support may vary. Make sure to check. Watts give a general idea of the power of speakers. Higher might no be always better. Jump to: Best Outdoor Bluetooth Speaker Reviews | IPX Rating Explained – Infographic | What’s aptX? Interested in other Bluetooth audio devices? It needs to be durable. The main thing we are all afraid of is, “Will my speaker survive if I take it outside?”. Because outside there is rain that will eventually catch you. And electronics don’t like water. 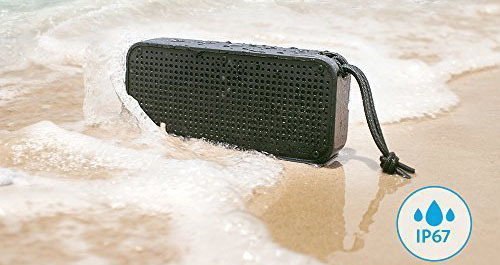 You might accidentally splash your speaker with water when you’re on the beach. Sand might get inside and ruin it. You might accidentally drop it on the floor and break it. There’s a lot of bad situations that can happen outside and aren’t good for your Bluetooth speaker. This is why picking an outdoor wireless speaker with good water-protection, sand/dust protection and a strong, rugged design resistible to drops is important. aptX is a Bluetooth codec that offers better sound quality. It’s a good thing to have. Basically, if your music device; smartphone, tablet… and your Bluetooth speaker support aptX you will get better sound over the wireless Bluetooth signal. Now you might not notice the difference if you’re not an audiophile but most people do hear it. Bluetooth transmission slightly damages the sound quality, aptX makes it almost non-existent with its efficient encryption. One of the most popular portable outdoor Bluetooth speakers is the UE Boom 2. With so many great features, it’s easy to see why this ranks so high. The design is sleek and the build quality is rugged enough to go just about anywhere. There is a lot more to discover about this wireless speaker, so let’s dig in. 15-hour battery with less than 3 hour charge time. The battery in the Ultimate Ears Boom 2 wireless portable Bluetooth speaker is capable of delivering up to 15 hours of playback time. While the battery life is generally quite good, there are some things you should know about that can affect it. You’ll get about two to three hours of listening time using the Boom 2 at the loudest volume levels. Music with a lot of bass may also require more power and reduce playback time. This isn’t a big deal for most users, but it is something to consider if you are planning to be outside all day and want the loudest volume. Average charge time is about 2.75 hours with the included charger using the micro USB charging port. An automatic shutoff feature helps conserve battery life when there is no music for 15 minutes. The UE Boom 2 can be paired and controlled by up to eight Bluetooth devices using the UE PartyUp app. And you can wirelessly connect up to 150 Boom 2 speakers together for great audio distribution and a surround sound experience. Bluetooth range is listed as good for up to 100 feet (30 meters). Your experience may vary depending on the mobile device and the environment around you. Another handy feature is that you can connect the Amazon Echo Dot to the UE Boom 2 for hands-free voice control with Alexa and music playback selection. Waterproof and dust-proof with a rugged design, prefect for outdoors. The cylinder tube design of the Boom 2 is well built and very portable. An outer skin helps protect against dust and splashing water. The body is built to IPX7 standards, making the UE Boom 2 waterproof for 30 minutes in 3 feet (1 meter) of water. 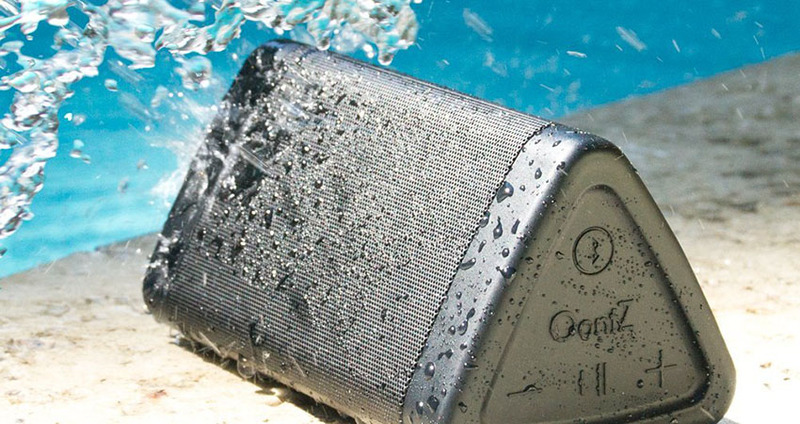 Even though this speaker is waterproof, it does not float, so be careful using it around the pool or deeper water. This is a great portable speaker to use around the house, in the yard, at the beach or pool, and even on a bike or boat. Shock protection is pretty good too so don’t worry about accidentally dropping the speaker and breaking it. Logitech provides good customer support for this product if you have any warranty concerns after using the UE Boom 2. One downside is that because the Boom 2 is so popular, there are a lot of fake units out there, so be sure to buy from a reputable reseller. Several colors and mounting options with app remote control. There are a variety of color options for this popular outdoor Bluetooth speaker. You can choose from black, white, red, green, blue, and the orange/purple tropical edition. You can easily carry this speaker, set it on its side, or stand it up. A tripod-mounting hole provides more mounting options and a detachable D-ring lanyard loop is included to allow for hanging the speaker. Besides wireless Bluetooth connectivity, you can also use a 3.5mm stereo cable to connect your device. There are only four buttons on the UE Boom 2 portable speaker: volume up, volume down, Bluetooth pair, and a multi-function power button. The multi-function button works ok, but the multi-press and hold options for play/pause and track advance are not the most convenient. Most device control is designed to be done through the playback device and using the UE PartyUp app. Optional cases are available for more secure storage and carrying options. 360˚ sound with lots of volume. One of the big advantages of the UE Boom 2 is that it does get loud. Maximum volume is listed at 90 dBA. Multiple speakers can be linked together to provide more sound coverage if one speaker is not loud enough for a large room or outdoor event. There are two 45mm active drivers that provide the big sound from the Boom 2. They aren’t huge, but they produce a good range of sound. Part of the reason for the enhanced sound is the use of two 1 ¾ x 3 inch (45mm x 80mm) passive radiators. These provide better bass while keeping the body sealed. Overall sound quality is good and the sound doesn’t breakup at high volume levels. However, one of the biggest complaints is that the bass isn’t super powerful. That is understandable when you consider the small driver size. Just know that the deep lows are about average for this size of device. Additional EQ can be adjusted using the app so you can easily experiment with different settings to get the sound signature you like best. When it comes to rugged durability, overall audio performance, and stylish design, the UE Boom 2 portable wireless Bluetooth speaker is a top pick for your on-the-go sound system needs. The Bose Soundlink Color II produces remarkably rich sound from a compact design. This Bluetooth speaker doesn’t have the best battery life, but it sounds great, is very portable, and is easy to use. Definitely worth checking out. 8-hour battery and multi-speaker pairing options. With an 8-hour battery life, the Bose SoundLink Color II Bluetooth speaker isn’t the top contender, but it makes up for it with quality sound and other features. Most of the minor negative marks for the SoundLink Color II are in the battery and power category. Bose also does not include a charging wall adapter, only a USB cable. It is recommended to use a 1000 mA (1 Amp) charger. This speaker can easily be used when the speaker is plugged in and charging, so it is great for long-term use in and around the home. An optional 30-minute auto-shutdown mode helps save battery life. Up to 8 mobile devices can be connected to the Bose SoundLink Color II. This allows for a lot of different playback options. Pairing is easily done by standard Bluetooth pairing and by using convenient NFC technology. Wireless range is OK, coming in at about 30-40 feet (9-12 meters). This isn’t amazing, but it is average for many Bluetooth devices. Durable case with rounded corners that is water resistant. This little speaker can go just about anywhere you’d like to take your sound, except underwater. The SoundLink Color II is not waterproof, but it is water resistant (IPX4 rating). It can easily handle minor splashing, a little bit of rain, or other common moisture. A soft silicone covered case provides an excellent non-slip surface to grab on and carry the speaker. The case and design are rugged enough to survive an average drop test. There are no external bumpers, but the corners are rounded. Easy control and lightweight design. Besides the wireless Bluetooth connectivity, you can use the 3.5mm auxiliary input jack for hardwired operation. The Bose Connect mobile app is useful for managing the connection of additional mobile devices with the ease of drag and drop. 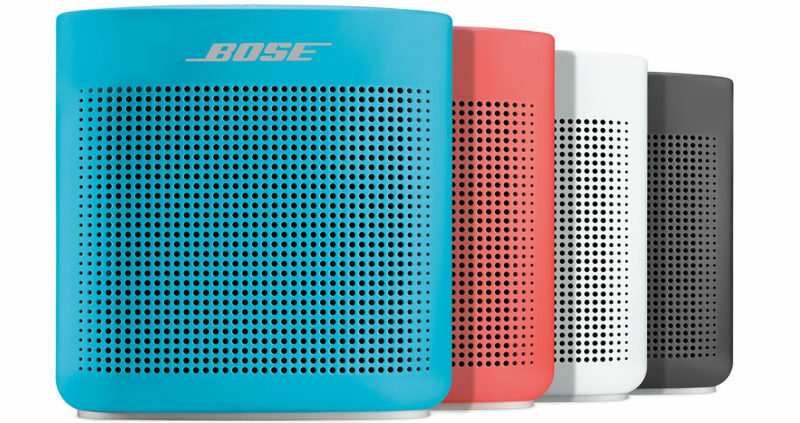 With a name like Bose SoundLink Color II, you’d expect a few color options. There are four: black, white, red, and blue. What are the best about wireless Bluetooth earbuds? Six buttons are located on top of the speaker. These buttons are for power on/off, Bluetooth pairing, input selection, volume up, volume down, and a multi-function button. The multi-function button is used for play/pause and track forward/back. You can even use this portable speaker as a speakerphone to take phone calls. It also works great with the Echo Dot for remote voice control and music playback. Three status indicators light up to show battery life, Bluetooth connectivity, and aux input connection. 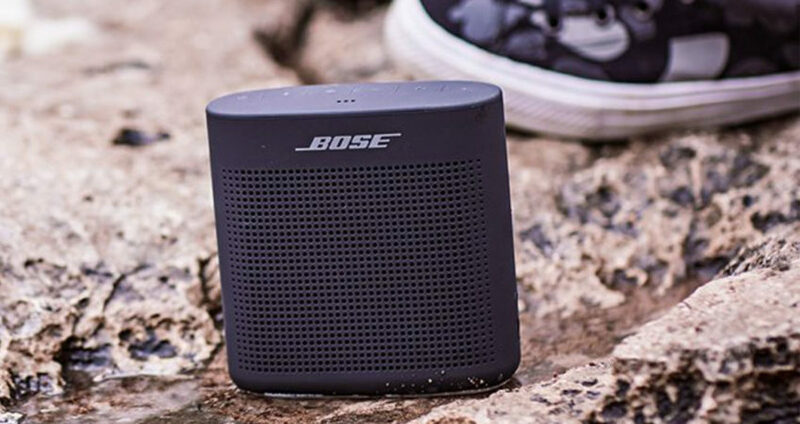 The Bose SoundLink Color II only weighs 1.2 pounds (0.54 kg) so you can easily carrying it around all day. Signature Bose sound quality from a small speaker. It is surprising to get such deep sound from this small of a box. To get the best sound, Bose recommends placing the speaker near a wall. As with most speakers, this can enhance the bass response. You will likely find that the best sound quality is found indoors, but the Bose SoundLink Color II sounds good outside too. It just has slightly less bass. Two opposing passive radiators help fill out the lower frequency range and reduce vibration in the enclosure. This wireless speaker isn’t as loud as the UE Boom 2, but it gets loud enough for most users. High frequencies are crisp and articulate so that you can easily understand vocal content. This is great for listening to music and audiobooks. The Bose SoundLink Color II Bluetooth wireless speaker is small enough to go anywhere, delivers good audio performance, is easy to use, durable and it’s a great option for an outdoors portable speaker. Besides looking tough and being up for anything, the Fugoo Tough outdoor Bluetooth speaker has an extra long 40-hour battery life. This speaker is 100% waterproof and there are several accessories available to make this the perfect adventure companion. Let’s explore a little bit more. Amazing 40-hour battery life on an 3.5 hour charge time. One area where the Fugoo Tough portable speaker beats out just about everyone is in its battery life. 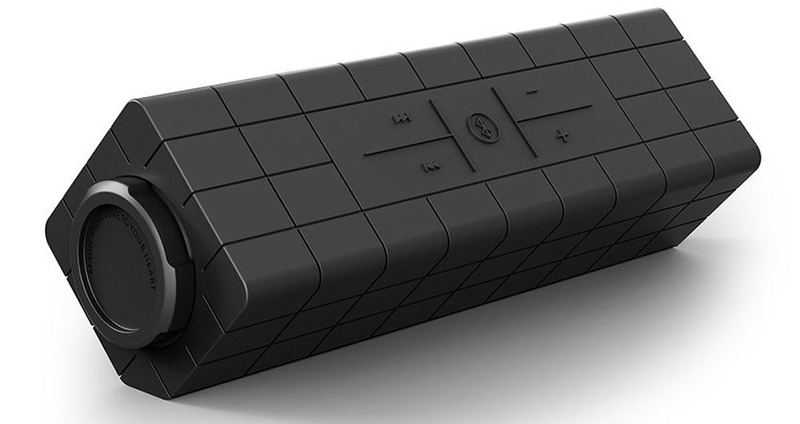 This wireless speaker can pump out the tunes for up to 40 hours on a single charge. And it only takes about 3.5 hours to fully charge the high capacity battery. 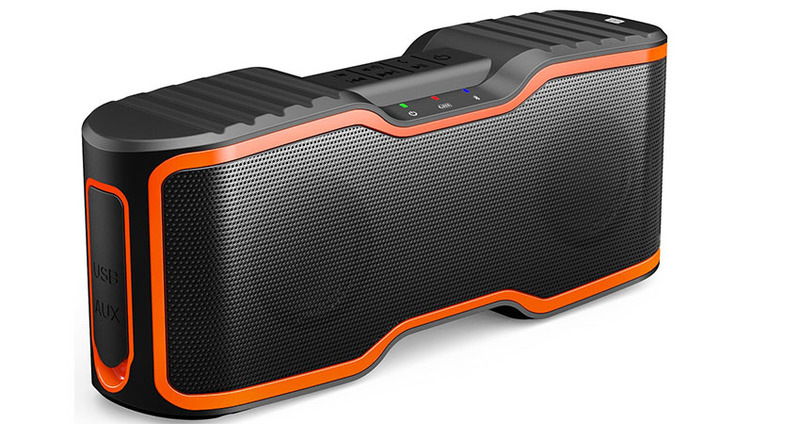 This is the perfect speaker for a long weekend trip or for working outside on a jobsite all week. You can’t connect multiple mobile playback devices to this unit, but you can use a separate waterproof remote in addition to a smartphone. The Bluetooth 4.0 connectivity and APTx codec provide reliable connectivity and quality sound for up to 33 feet (10 meters). Super tough design with a dustproof and waterproof case. The Fugoo Tough looks super tough. And it is. You can drop it, soak it in water, run it through the mud, or put it in the snow and it will still work. The IP67 rating means that you can submerge this speaker in one meter of water for 30 minutes without damage. Just know that it does not float. Other than that, this durable speaker is up for just about any challenge or adventure. It is easy to clean the Fugoo Tough by simply rinsing it off in the sink or shower. You can also remove the inner speaker core for more detailed cleaning if needed. There are metal screws that hold the outer case together and those might show a little bit of rust if the speaker is not dried off after being wet for a while. Several mounting options and accessories. An omnidirectional microphone provides good speakerphone quality. Digital signal processing is also included for background and wind noise reduction. The Tough comes with a micro USB cable and power adapter for a complete charging kit. Basic controls included volume up/down and a multi-function/power button. These buttons have a nice “click” feel and response to them. There are a lot of accessories available for the Fugoo Tough Bluetooth speaker. Optional add-on components include: bike mount, strap mount, multi mount, remote control wristband, and a Go-Float inflatable raft. There is only one color scheme: black with silver trim. Other Fugoo speaker cores are available in a variety of styles. The Tough jacket is available separately if you already have a different Fugoo core. Despite its tough and big appearance, the Tough only weights 1.4 pounds (0.63 kg), so it is easy to pack it around for any occasion. The only slightly annoying feature with this wireless speaker is the voice prompt that announces when the speaker is turned on/off or when changing input modes. 6 drivers for maximum sound coverage and high volume output. Many Bluetooth speakers come with four drivers, generally configured with two active speakers and two passive radiators. The Fugoo Tough includes six drivers for great 360˚ sound coverage. There are two 39mm woofers for the lows, two 28mm tweeters for the highs, and two 42x54mm passive radiators for extended bass response. The outer case of the Tough provides good isolation but the speaker can vibrate a little bit when extra low bass notes are played at higher volumes. Earlier models of this speaker experienced some maximum volume limitations, but newer firmware updates let you achieve louder levels. A maximum volume of 95 dBA is possible. Just be aware that the sound can begin to distort a bit at the highest volume levels. If you want a portable speaker that is as tough as it looks, can go everywhere you go, and play music for up to 40 hours then the Fugoo Tough is an excellent option to consider. The Braven BRV-X portable wireless Bluetooth speaker for outdoors pumps out great sound and will even charge your portable electronics via the USB power bank. Indoor/Outdoor sound modes provide extra flexibility for getting great sound in or out of the house and the durable case will stand up to just about any environment. Built-in power bank for charging other devices plus a 12-hour battery life. In the range of available battery-powered Bluetooth speakers for outside use, the Braven BRV-X scores a solid average with a 12-hour battery life. This makes it perfect for most all-day excursions. One big advantage of this portable speaker is that the internal battery can be used as a power bank to charge your other electronics via the standard USB-A connector. The 5200 mAh power bank makes this a super convenient speaker for remote trips where you don’t have access to other power sources. Here is the important thing about this product: you need to use the special charging cable and adapter to charge the BRV-X. This unit does not charge from a micro USB port like many other speakers do. The USB-A port is only for charging other devices. A convenient battery level indicator is included to provide charge capacity information so that you know when you’re running low on power. Power save mode shuts the speaker off if there is no connection for 30 minutes. Bluetooth pairing is pretty straightforward and NFC pairing is quick. Two Braven BRV-X units can be connected together to provide a true left/right stereo listening experience. Strong design that can survive a drop test. The shockproof case of the Braven BRV-X very strong and can be dropped or thrown around without suffering significant damage. There seems to be some discrepancy in the waterproof rating of this speaker. Information available on the company’s website indicates that this is IPX7 (waterproof) rated. 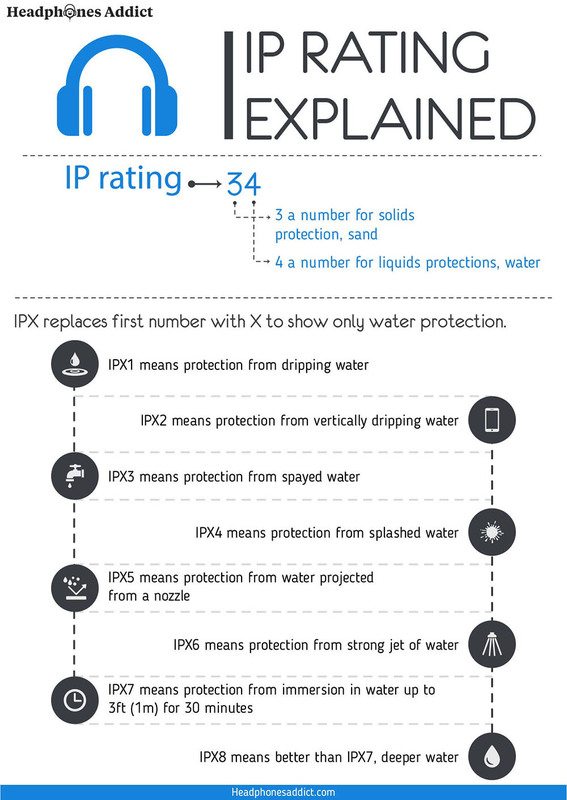 However, the manual says that it is IPX5 water resistant and not intended to be submerged. Here’s a guide on the most-durable in-ear headphones. The charging and auxiliary audio port connections are available under a watertight twist-lock cover. Make sure this cover is secured before getting the speaker wet. Even though this is a durable product overall, there are some reports of product failure. This is likely due to manufacturing issues or quality control problems. Most users can expect good reliability from the Braven BRV-X. Just pay attention to your unit and start a warranty claim if you have any battery life or charging issues. Indoor/Outdoor listening mode option for sound tuning. 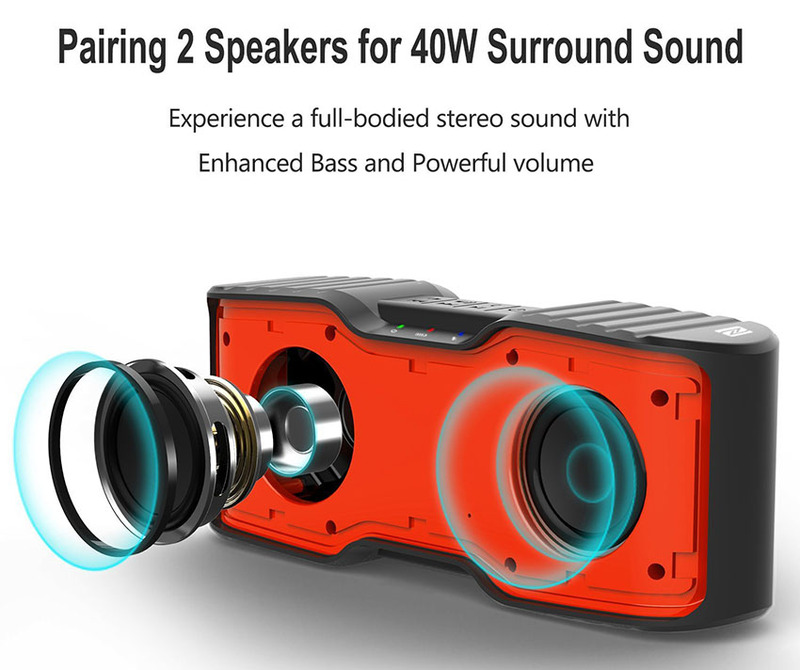 Four control buttons are included on top of the portable speaker. The buttons are for volume up, volume down, power, and play/pause/pairing/call answer. Another button is included near the charging port to check the battery status. A switch is also included to allow the selection of indoor or outdoor listening modes. This function changes the audio response of the speaker (more on that in a moment). Two color options are available: black and gray/white. A titanium metal loop is built into the unit so that you can use the included carrying strap to easily secure or transport the speaker. You can also use this speaker as a speakerphone. Good vibration isolation and True-Stereo speaker pairing option. 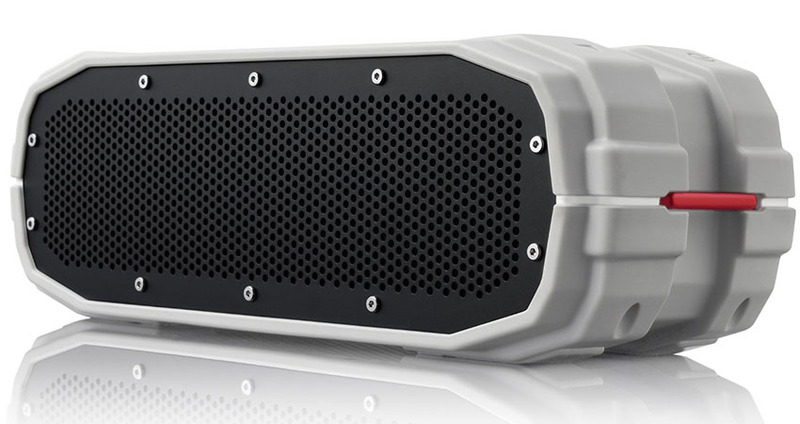 The Braven BRV-X produces a respectable level of sound with good low frequency response. Two full-range drivers deliver quality sound. A single down-facing passive radiator enhances the bass tones. Placing the speaker on a table will provide the best bass because of the bottom radiator. The rubberized coating around the case provides good vibration isolation and keeps the speaker from sliding around at louder volume levels. Overall volume output is good, but this isn’t the loudest portable speaker. It is not quite as loud as the UE Boom. A great feature that sets this speaker apart from several other products is that you can pair two BRV-X units together for true stereo sound and added volume. The indoor and outdoor sound profile modes work quite well to enhance vocal and bass performance for each space. These modes basically change the EQ profile. There are some users that have reported audio quality issues, but this is likely because of a defective unit from the factory and should be replaced under warranty. 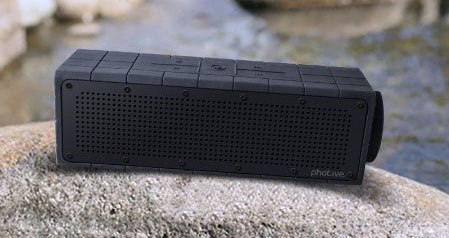 The built-in power pack, heavy-duty design, and dual listening mode of the Braven BRV-X wireless Bluetooth speaker make it one of the best options for tough outdoor use. Anker makes a lot of power banks and chargers, so it’s no surprise that the Anker SoundCore SportXL Bluetooth speaker has a power bank included. This portable speaker and power bank provides powerful sound without over emphasizing the bass or distorting. It delivers great value for the price in a durable design. Here’s a nice sound comparison video. 15-hour battery life and a power bank for USB device charging. The 15-hour playback time of the Anker SoundCore SportXL wireless speaker is one good reason to check out this unit. The other reason is that the battery also provides remote charging capacity for all of your USB power compatible devices. The power bank is rated at 5 Volts and 1 Amp. A micro USB port and cable are included to recharge the internal battery. Playback time estimates are accurate as long as the volume and Bluetooth range are not maxed out. Bluetooth 4.1 range is a respectable 66 feet (20 meters), but best reliability and performance is found at 20-40 feet (6-12 meters). A dedicated button is provided for simple Bluetooth pairing. Battery indicator lights are located next to the pairing button. Waterproof case with an 18-month warranty. A silicone coating on the outside case provides decent shock protection for the Anker SoundCore SportXL Bluetooth speaker. It can withstand a lot of natural hazards. The weight and construction feels solid and the electronics are protected by the IP67-rated waterproof case. Perhaps the biggest drawback of the design is the rear facing passive radiator port. Even though it is tough, it can feel flimsy when pushing against the protective cover. This issue isn’t really a big deal since you would need to push on the passive radiator pretty hard to break or tear it. It may be possible to experience lower than average battery life. This can be caused by a manufacturing issue or by over-using the built-in accessory charging port. Anker provides a great 18-month warranty for any support claims and their customer service department is very responsive. There aren’t a lot of unnecessary features included with this wireless speaker. What you get from Anker is simple and reliable functionality. Five buttons are located on the top of the unit for control of power, volume up/down, play/pause, and Bluetooth connect. The buttons are responsive and feel solid when you press them. The charging ports and 3.5mm auxiliary audio jack are located on the lower rear of the speaker. A simple hand strap is provided to aid in carrying the speaker. It can also be easily grasped around the case. Loud and clear sound that isn’t too heavy on the bass. Two full range 8 Watt speakers provide powerful sound and two passive radiators work as subwoofers to fill out the low end. The general sound quality is somewhat flat when compared to similar products. This is a great thing if you don’t really like your bass frequencies over-emphasized. The front-facing speakers provide crisp audio that isn’t too harsh and the passive radiators in the back fill out the sound with a modest bass response. Listeners that like classical, folk, jazz, and rock music will likely appreciate the sound quality of the Anker SoundCore SportXL speaker. Loudness is very good inside and outside. The sound doesn’t breakup or distort too much when the volume levels are maxed out, so this is a good speaker if you need loud and clear sound. With all of the included features and overall great performance, the Anker SoundCore SportXL is a top pick for the best value and bang for the buck in this category. 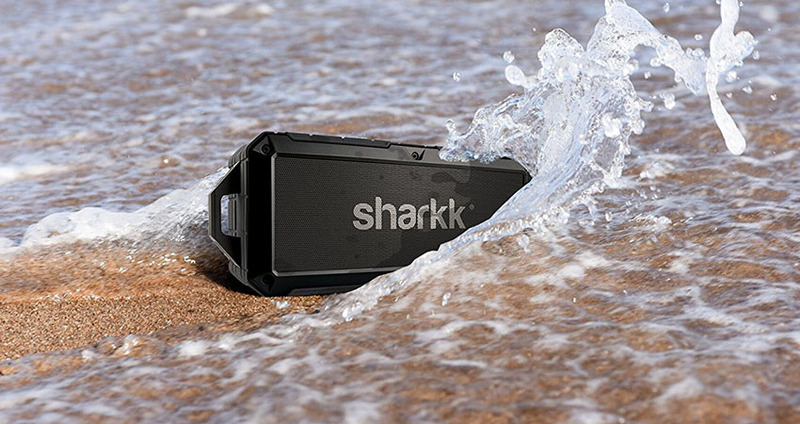 The Sharkk 2O waterproof Bluetooth speaker features a long connectivity range, average audio quality for its size, and a decent battery life. A microSD card slot is available for convenient MP3 playback and two models are available for different loudness requirements. 10-hour battery life with excellent Bluetooth range. 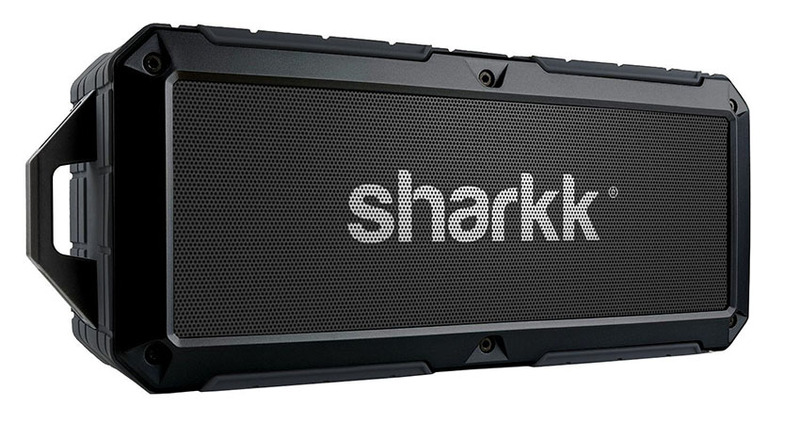 Battery life for the Sharkk 2O outdoor wireless speaker will last you about 10 hours. It’s not bad, but it’s not exceptional either. The time rating for the battery is fairly accurate and it holds a charge well. A micro USB cable and power adapter is included for charging purposes. There is a power saving mode that allows the speaker to turn off if there is no content for ten minutes. Bluetooth 4.0 range is good for up to 100 feet (30.5 meters), but you will have more reliable connectivity at 66 feet (20 meters) and lower. Heavy Bluetooth traffic can also cause interference or limit your effective Bluetooth range, so be aware of that. NFC pairing technology allows for a quick connection with mobile devices. Additional connectivity is available via the 3.5mm audio jack and a built-in microSD card slot. Good protection against water and abuse. 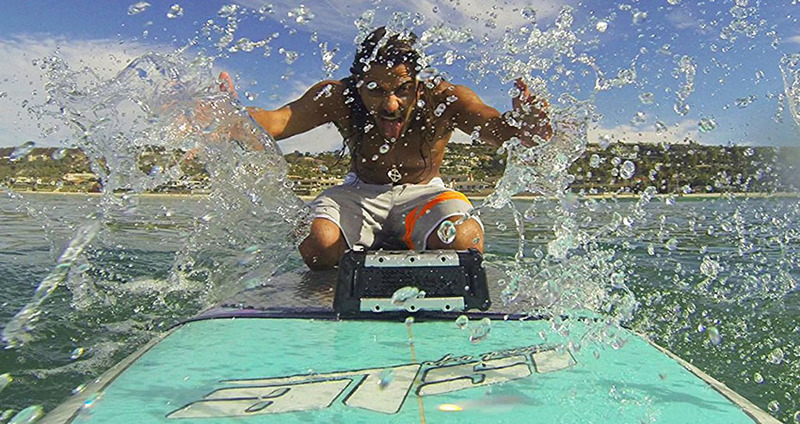 The rubber-coated exterior protects the Sharkk 2O portable speaker from drops and scrapes. The case is sealed to IP67 specifications for waterproofing to one meter for up to 30 minutes. The enclosure is dustproof as well. Most user complaints about this speaker are about the Bluetooth range being less than they expected and not so much about the overall construction quality. A one-year warranty is provided for any issues that might come up after you buy this portable speaker. Heavier speaker that is still easy to carry. With a total weight of 1.9 pounds (0.86 kg), this isn’t the lightest speaker on the list, but it is still very easy to pack around. A Velcro strap is provided so you can attach it to the built-in loop on the speaker case. There are plenty of control buttons that provide convenient access to common device functions. A power button is located on the side of the speaker above the charging and auxiliary port pocket. NFC pairing, Mute, Play/Pause, Track Forward/Back, Volume Up/Down, and Call Answer buttons are all located on top of the speaker case. While the buttons are easy to use, the labeling of the buttons can be hard to read. You may need to look closely or feel for them until you remember their location. A voice alert feature will notify you when a call comes in so that you can answer it with the built-in speakerphone functionality. 8-Watt and 20-Watt models available for more volume. There are two versions of the Sharkk 2O. The standard 8-Watt version provides a reasonable amount of sound, but you may want to upgrade to the 20-Watt model for more powerful output and higher volume. Dual active drivers pump out a decent amount of audio, but there aren’t any passive radiators so you won’t notice a lot of low energy from this portable speaker. Sound quality and volume levels are solidly average. This speaker doesn’t sound bad, but it doesn’t surprise you with a large soundstage or deep bass performance. 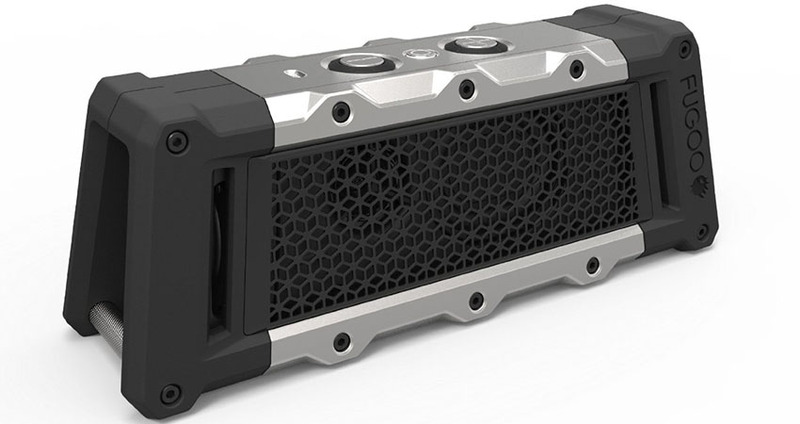 The Sharkk 2O waterproof Bluetooth speaker is one of the best options available if you want the convenience of Bluetooth connectivity, rugged construction, and a built-in microSD card slot for local playback. This wireless Aomais Sport II portable Bluetooth speaker for outdoors packs plenty of power in a package that is easy to carry and jam out with. A stereo pairing option can double your output power and there are several accessories that let you take this speaker everywhere. 2 power saving modes and 10-hour battery life. The rechargeable battery in the Aomais Sport II Bluetooth speaker delivers a reliable 7-10 hours of playback time. There are two power saving modes that you should be aware of. The speaker will automatically turn off after two minutes if there is no Bluetooth connectivity and no content. The speaker will automatically turn off after 15 minutes if there is Bluetooth connectivity but no content. A micro USB cable is provided for battery charging, but there isn’t a power adapter included in the package. The range for the Bluetooth 4.0 connection is average, with a reliable connection between 33-66 feet (10-20 meters). Waterproof with smooth rubber coating around case. The build quality of this portable speaker is good and the ergonomic design makes it easy enough to hang onto. The smooth rubber coating provides protection and a grip on flat surfaces. An IPX7 rating means that the Aomais Sport II wireless speaker is waterproof, but it is not dustproof. You also want to make sure the charging port flap is closed securely so that it keeps a tight seal. Some users may experience a leak in that area if the seal is not tight. As with a lot of battery-powered electronics, there can be some battery manufacturing issues. This product is no different. The battery life is generally very good, so if you receive a unit that won’t last at least 7 hours, be sure to contact the company for a warranty replacement. A 12-month warranty is provided for the Sport II. Includes inflatable float accessory and stereo pairing option. Two color styles are available in Black/Green and Black/Orange. There are also several add-on accessories available for mounting and carrying the speaker. A threaded tripod-mounting hole allows the Aomais Sport II Bluetooth speaker to be mounted to an optional bicycle mount or other stand. That’s very useful for outside use. An inflatable float accessory is included as a nice bonus. The built-in stereo pairing mode allows two Sport II speakers to be connected together for increased volume and coverage. This speaker weights about 1.4 pounds (0.63 kg), so you may want to purchase the separate sling cover with a handle that lets you carry the speaker a little easier. Several buttons and indicator lights on top of the case give you maximum control of the speaker and playback device. The buttons are compact and a little bit hard to read, but the indicator lights for power, connectivity, and battery are a nice touch. Large speakers with plenty of power. 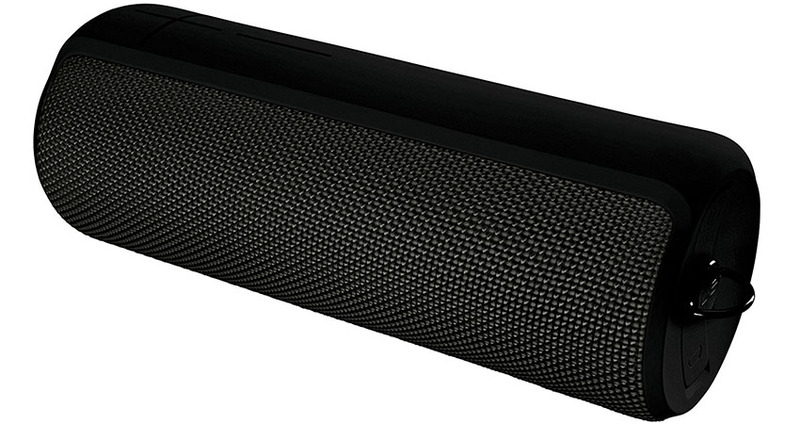 With 20 Watts of power and large 52mm drivers, this portable speaker packs a punch. Bass response is good, but it won’t blow you away. Sound quality is good both indoors and outside. High frequencies carry pretty well, even at a distance. Loudness is good for most users unless you are working or playing in an already loud environment. Adding a second Aomais Sport II speaker in stereo pairing mode will add even more sound and volume. A reliable battery life of about 10 hours and the free inflatable float accessory combined with a 20 Watt speaker and stereo paring options makes the Aomais Sport II a solid Bluetooth speaker worth checking out. 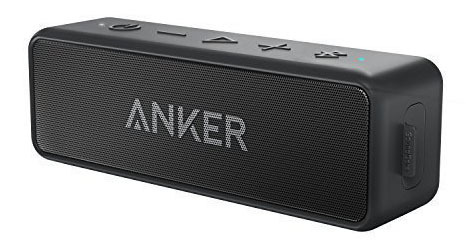 For such a compact and lightweight speaker, the Anker SoundCore 2 does a great job producing big sound and good bass. A long battery life lets you listen for up to 24 hours, whether you’re connected to your smartphone, Amazon Echo, or a wired playback device. 24-hour battery life that is perfect for weekend trips. With an impressive 24-hour battery life, this little speaker is perfect to take on your next adventure or weekend trip. The charge capacity is pretty accurate as long as you aren’t using the speaker at the loudest volume levels. 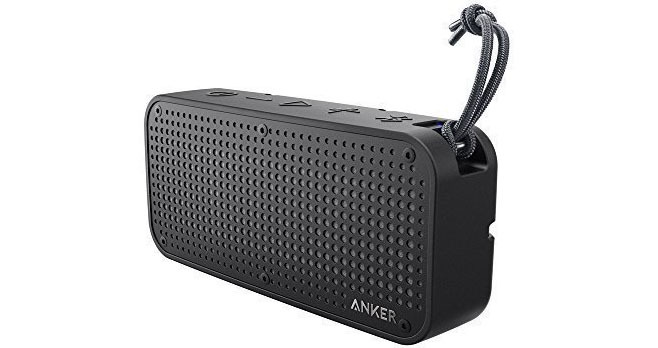 A micro USB cable is provided, but you’ll need to use a computer or other USB power supply to charge the Anker SoundCore 2 Bluetooth speaker. Unlike some other Anker portable speakers, the SoundCore 2 does not include a power bank option for charging other devices. Updated Bluetooth 4.2 connectivity provides good range and reliable playback for up to 66 feet (20 meters). This speaker doesn’t remember multiple Bluetooth devices, so keep that in mind if you like to switch among several different playback electronics. Splash proof design with an improved protective cover. The Anker SoundCore 2 portable speaker isn’t completely waterproof, but it is splash proof (rated IPX5). You won’t have to worry about it getting a little wet. The improved front cover protects the active and passive drivers better than the previous model. This is a good speaker for casual, everyday use. However, it is probably best not to take this on adventures where it is exposed to a lot of water, dust, and drops. Anker provides an 18-month warranty and excellent customer service if you have any trouble with your speaker. Lightweight design that is convenient to pack in a bag. At only 12.6 ounces (357.2 grams), this is one of the lighter speakers on this list. Its compact design and lightweight materials make it easy to carry or toss in a bag. Large control buttons provide quick and easy access to basic functions like power, volume up/down, play/pause, and pairing. A 3.5mm audio jack is provided for additional hardwired connectivity. The coating on the case is smooth, but it still has a soft rubbery feel that keeps the speaker from sliding around. Anker offers a premium leather travel case for the SoundCore 2 at an additional charge. The built-in microphone works well for conference calls or other speakerphone needs. The SoundCore2 might appear to be a basic Bluetooth speaker, but it offers plenty of reliable performance in a small package. It also works great with Amazon Alexa and the Amazon Echo Dot for voice control. Good balance and surprising bass response. Dual active drivers and one passive radiator put out more sound than you might expect from this small speaker. Bass and treble frequencies are balanced fairly well, and the bass response is surprisingly powerful given the 12-Watt driver rating. The Anker SoundCore 2 sounds good in most environments, but it will perform a little better indoors on a table and in small-to-medium rooms. This portable speaker doesn’t have as wide of a coverage area as some other speakers on this list, so you shouldn’t expect 360˚ sound. One negative mark against the sound quality is that it does go down rather quickly and the bass distorts as you reach the highest volume levels of the SoundCore2. 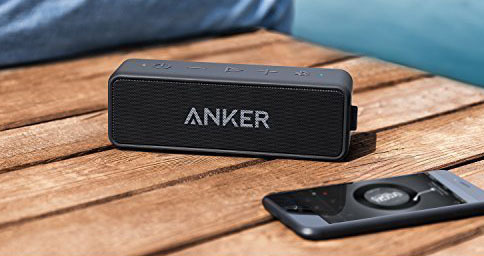 The Anker SoundCore 2 is a good improvement on the previous model and it offers good functionality and excellent battery life for the size of this lightweight outdoor Bluetooth speaker. The Photive Hydra wireless Bluetooth speaker is rugged, water and dust resistant, and provides up to 8 hours of audio playback. Audio quality is ok, but you might find better performance from one of the other picks on the list in this price range. Shorter 8-hour battery life with average Bluetooth range. The battery life of the Photive Hydra is only rated for 8 hours, making it one of the lowest ratings on this list. Many users do report longer battery capacity though. You may be able to get more playback time from this portable speaker when using hardwired mode and listening at a lower volume level. There is a micro USB cable that ships with the speaker, but no power adapter. You’ll also want to pay attention to the charging port concerns noted below. Bluetooth 4.0 connectivity and range are OK, so you can expect a solid connection within the standard 33 feet (10 meter) distance. Wireless headsets for gaming compared. Water resistant with rubberized exterior. This little wireless speaker is built to IP66 standards, which is better than IPX5, but it isn’t technically waterproof or dustproof. You can expect the Photive Hydra wireless Bluetooth speaker to work fine in most damp or wet locations as long as you don’t submerge it for very long. Great for all outside activity. If you do drop it in the water, the speaker will float, but the speakers will be pointing down so it won’t sound very good. A tight fitting cap seals off the charging and auxiliary audio port and an aluminum grill helps protect the speaker drivers. The general construction and build quality is good, and the rubberized exterior makes the speaker feel well made. The biggest complaint and cheapest component of this speaker is the built-in micro USB charging port. This port can break away from the inside of the housing after repeated use. Photive does provide a one year warranty, but the charging port issue would likely show up after the first year. Angled case for better sound from a floor or table. Besides its robust outer construction and water resistance, the Photive Hydra portable speaker has a convenient physical feature. The back corner of the case is angled so that the drivers can point up. This makes it easy to place the speaker low on the floor or ground and still hear good sound. This design feature also makes the Hydra easy to hold and carry. It is fairly light as well, weighing only 15 ounces (425.2 grams). Additional cases, dry bags, and accessories are available at an extra cost. There are step-by-step instructions included so that you can quickly connect an Amazon Echo to the wireless Hydra speaker. A power switch is located under the cap on the side of the speaker. All other control buttons can be found in the rubberized material on top of the speaker case. Something that may be annoying for some users is the blinking LED that lights up when the unit is turned on. This cannot be turned off. Good sound for smaller listening areas and perfect for audio-books. The Photive Hydra Bluetooth speaker features two 40mm active drivers and one passive radiator that functions as a basic subwoofer. With only 7 Watts of total output, this speaker isn’t going to get really loud, but it is good for smaller listening areas or placing somewhere nearby. You won’t hear a wall of sound or a wide soundstage from the Hydra. Music does sound decent though. Audiobooks and spoken word material may be a little harder to understand or boost in volume depending on your listening environment. This is an ok sounding speaker for the price, but there may be a better option if you want better performance. A good case and lightweight design are the best part of the Photive Hydra wireless Bluetooth speaker, but since this is a budget speaker the sound and overall durability can’t compare to higher end other options on this list. But great for the price. Don’t let the size and weight of this little wireless speaker fool you. The Cambridge SoundWorks Oontz Angle 3 ultra portable wireless Bluetooth speaker is loaded. If you want a good sounding speaker in a super small, durable package for a great price, you’ll want to keep reading. Playback time up to 12 hours. The Oontz Angle 3 is powered by a 2200 mAh rechargeable battery the delivers up to 12-hours of playback time (at roughly 2/3 maximum volume). This is pretty good when you consider the level of sound coming from such a small wireless speaker. Bluetooth range is reasonable, supporting the basic 33 feet (10 meter) standard that other similar devices use. The best audio quality and connectivity will be at about 20 feet (6 meters) or less. Pairing can be accomplished easily but this particular speaker does not support NFC pairing. A 3.5mm auxiliary jack is provided for hardwired audio connection. Triangle design is very strong and splash proof. A triangle is the strongest shape, so it makes sense that the Cambridge SoundWorks Oontz Angle 3 wireless speaker is tough. This speaker has even been run over by a truck and still worked, although that really isn’t a recommended way to use your speaker! When considering the case and component build quality, this wireless speaker is a robust little unit. The IPX5 rating leaves something to be desired in the water resistance category though. The Oontz Angle 3 is splash proof but it is not waterproof or dustproof. A rubberized coating around the case works well for a comfortable grip, but the charging port flap tends to collect dust because of the soft material. You should get a lot of use out of this portable speaker with average care and maintenance. Super compact design that only weighs 9 ounces. The Cambridge SoundWorks Oontz Angle 3 Bluetooth speaker weighs a mere 9 ounces (255 grams). This easily makes it the lightest portable speaker on this list. It is only 5 x 2.8 x 2.5 inches (127 x 71 x 63.5 mm), so it can easily be packed away or carried just about anywhere. An optional carrying case with a clip is available separately. The primary control buttons are positioned on one end cap. The power button, charging port, and 3.5mm audio jack are on the side edge. There is even a small microphone so you can use this speaker as a speakerphone to receive calls. Clear highs and lows for such a small speaker. Even though it is small, the Oontz Angle 3 produces a good balance of highs and lows. Two active drivers emit clear highs that are bright, but not shrill or too tinny. Low frequencies are given a boost with the help of a passive radiator. One reason for the enhanced bass response is because of the passive radiator that fires down from the bottom of the case. This radiator pushes low energy against a tabletop to help produce a more rich listening experience. However, the lightweight design of the case can be a problem when the speaker is run at higher volumes with heavy lows in the music. The down-firing radiator can cause the speaker to move around since it is so light. It is best to set the speaker upright on one end if you are playing louder, bass heavy music. This technique will reduce the perceived bass response, but the speaker will at least stay on the table. 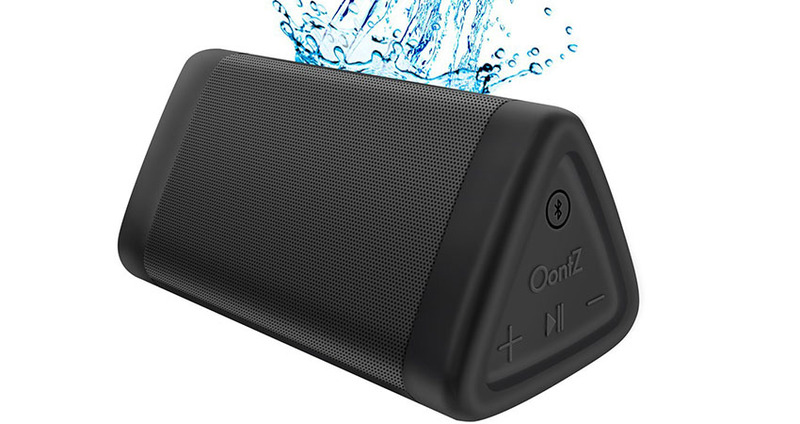 The Cambridge SoundWorks Oontz Angle 3 is a top budget Bluetooth speaker for outdoors because it is so lightweight and produces good sound for the price.